The science is in: Climate change is here now, not in the future, and it’s already having devastating effects on people’s lives. This is a moment of intense danger and fragile hope. Humanity is at a crossroads increasingly marked by economic instability, corporate takeover of the political process, wars, and violence of all kinds. At the center of these crises looms the spectre of climate change, exacerbating each of the others and threatening our very existence. But what if someone told you they knew how to stop the world’s climate from tipping us over into chaos? You’d be interested, right? 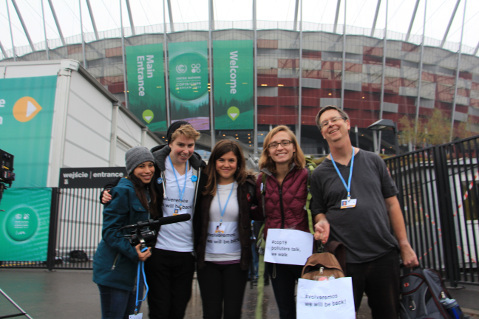 UCSB's contingent at the UN climate change talks in Warsaw in November 2013 were (left to right) Summer Gray, Ben Liddie, Natasha Weidner, Corrie Ellis, and John Foran. In just a day or so, the UCSB-based Climate Justice Project is hosting a gathering that we hope will feel like something between a film festival, an academic conference, a training for activists, and a celebration, with something for everyone, from any background, who is passionate or just plain curious about how to chart pathways to a better future. And this is the good news: People all over the world are linking hands, both in real and virtual spaces, to stand up to the economically and politically powerful one percent who are causing the degradation of all life. They are coming together in a network of hope and action that many are calling the Global Climate Justice Movement. At this network’s core is the principle of climate justice: the desire that all humans claim responsibility for our impact on the world’s climate, so that communities may reclaim their rights to “live well” with healthy, creative lives rather than simply to “live better” or consume more, and an invitation to join together to construct a future based on equity, deep democracy, and cooperation. This involves unlocking the creativity of every Earth citizen to reimagine the world in which we live in order to make way for new possibilities. Our gathering on May 10 is all about the good news: the rise of a global climate justice movement which is growing in numbers, reach, strength, and inventiveness. It is impossible to encompass easily, because it consists of thousands of organizations at every level — community, city, region, nation, and global — interlinked in a network of networks. But it is there, and our gathering will examine some of what it has accomplished so far, where the point of impact lies at the moment, and what strategic decisions must be faced moving forward toward December 2015, when the United Nations convenes the meetings of the COP 21 — the 21st annual U.N. climate summit — in Paris to finalize the global climate treaty it has been working on for several years, a treaty that may represent our last, best chance to contain the further climate change that is barreling toward us. In his powerful essay “Global Warming’s Terrifying New Math: Three simple numbers that add up to global catastrophe — and that make clear who the real enemy is,” published by Rolling Stone, Bill McKibben, author, scholar, and cofounder of the climate justice organization 350.org argues that the world’s largest fossil-fuel producing corporations and countries must be compelled to leave 80 percent of their proven reserves (and thus their actual value) in the ground. This is the inescapable physical logic of salvaging a livable planet for future generations. I find this a compelling argument: To have a reasonable chance (as McKibben puts it, “‘Reasonable’, in this case, means four chances in five, or somewhat worse odds than playing Russian roulette with a six-shooter”) to stay under a 2-degree Celsius temperature rise in this century, we can only burn a given amount of fossil fuels (2 degrees is a threshold that once passed is likely to bring irreversible and unlivable climate change). In July 2012, at the time of writing, McKibben put this atmospheric cap at 565 gigatons of CO2, roughly a 15-year supply — till about 2027 — if “business as usual” trends of economic production and growth continue. The terrifying part of course is the estimate that the world’s already “proven” reserves exceed the cap by five times, and this figure is edging upward even as the remaining atmospheric space for greenhouse gases inexorably dwindles. Our common future, then, seems increasingly to be a race between the damaging effects of climate change and its corporate and nation-state sponsors, on the one hand, and the efforts and ability of this budding movement to check those effects, bring to a halt the rate of increase of the greenhouse gas emissions that cause global warming, and then rapidly reverse the trend downward by defeating the forces of planetary ecocide at the ballot box, in the streets, at our places of work and consumption, and in the very culture and media in which we live. This is what we must do: use all of our amazing collective and creative talents to assemble the biggest, broadest, most hopeful, loving, and powerful social movement the planet has ever seen. Our call for a gathering goes out to all who wish to explore the potential of movements for climate justice and who wish to reimagine together the possibilities for achieving a better world from the local level to the planetary. Come and engage in the art of remaking the world in which we live, love, work, imagine, and dream. Re-Imagining Climate Justice: At the Crossroads of Hope and Possibility at UCSB all day on Saturday, May 10, promises to be a magical, inspiring gathering for all those who want to take action in defense of life itself. See you there! John Foran is a professor of Sociology and Environmental Studies at UCSB, codirector of the International Institute of Climate Action and Theory (iicat.org), and a member of 350sb.org.